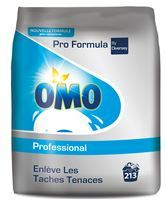 Pro Formula offers a complete line of cleaning products specifically formulated for professionals, combined with trusted Unilever brands such as Cif, Omo, Skip and Sun. Specifically designed to meet your needs and bring you the best results from the first use. With peace of mind, you just have to focus on your core business. 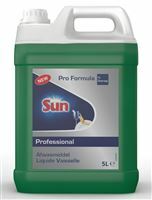 For very persistent stains, soak in a warm solution of Skip Professional Advance. Gently rub the outline of the stain with the soaking solution before allowing to soak. 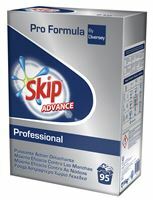 As soon as possible, soak or wash the fabric with detergent detergent such as Skip Professional Advance. Wash preferably at 60 degrees. 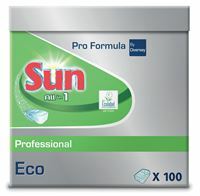 The combination of whitening agents and heat will remove stains. First, read carefully the care label of the fabric. Large spots may need to be dry cleaned, or treated with a solvent for grease stains. 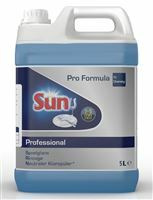 Recent small spots can be treated by rubbing the fabric with talc, leave on for 30 minutes, then brush and wash as usual with detergent detergent such as Skip Professional Advance.